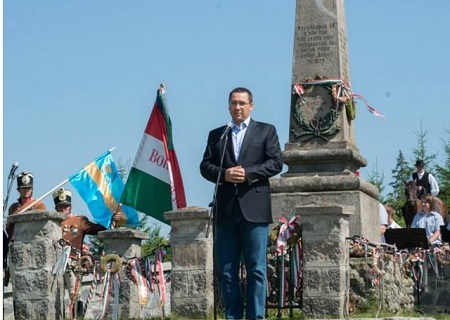 On Sunday, Romania’s Prime Minister, the 41 year old Victor Ponta, addressed about 200 people in Nyergestető (Piatra Niergeș), Hargita in Hungarian, during a commemoration that recalled the 165th anniversary of a critical battle during the 1848/49 Revolution and War of Independence. Mr. Ponta was invited to the commemoration by Hunor Kelemen, president of the Democratic Alliance of Hungarians in Romania (RMDSZ), who also serves as Romania’s minister of culture. The Romanian prime minister compared this event in the region’s history to that of the Battle of Thermopylae from 480 B.C., when Persian forces vastly outnumbered King Leonidas’ Greek and Spartan troops in a narrow mountain. The defending troops, nevertheless, put up surprisingly stiff and heroic resistance. “These people deserve our recognition, because they laid their life down for ideals that all nations share, namely freedom and the right to self-determination, which our countries have fought for in the face of the Viennese, Tsarist and Ottoman empires”–remarked Prime Minister Ponta of the Hungarian soldiers. Victor Ponta speaks before the Szekler and Hungarian flags in Nyergestető, Hargita county. Photo: Levente Vargyasi. Although this commemoration is held each August in Nyergestető, Mr. Ponta is the first Romanian prime minister to ever attend. Mr. Kelemen noted that having the head of government present is critical, as it helps strengthen dialogue between the Romanian and Hungarian populations. “Prime Minister Ponta can only really get to know Hungarians if he encounters us in our homeland,” noted Mr. Kelemen, referring to the Hungarian-majority Hargita county, which also forms part of Szeklerland (Székelyföld). “The more often you invite me to this region, the more frequently you will see that several flags can fly, without this resulting in a war that no one needs,” added Mr. Ponta, in reference to the controversial Szekler flag, which is seen as a symbol of Székelyföld’s drive for autonomy and which is banned on Romanian public buildings. And indeed, directly behind the Romanian prime minister, a man dressed in a period uniform waved a large Szekler flag (székely zászló). Mr. Ponta did, however, quote Romanian revolutionary Nicolae Bălcescu, in calling for cooperation and solidarity between Hungarians and Romanians. “We can have common goals, we can understand and respect each other, but if we are divided, someone else will always win,” remarked Mr. Ponta. “It is our duty to heal the wounds”, added the Romanian prime minister. Hungary’s Viktor could learn a thing or two from his namesake next door.